In the Pacific Northwest, summer days are long and bright. We spend those long, late sunny summer evenings entertaining friends, sometimes twenty or thirty at a time, in the best way my husband and I know how: with a table overflowing with good food and good drink. As those afternoon barbecues linger on into evenings, I like to serve something a little sweet, but mostly decadent. Something to delight our guests, and something that makes the most of summer time fruits. 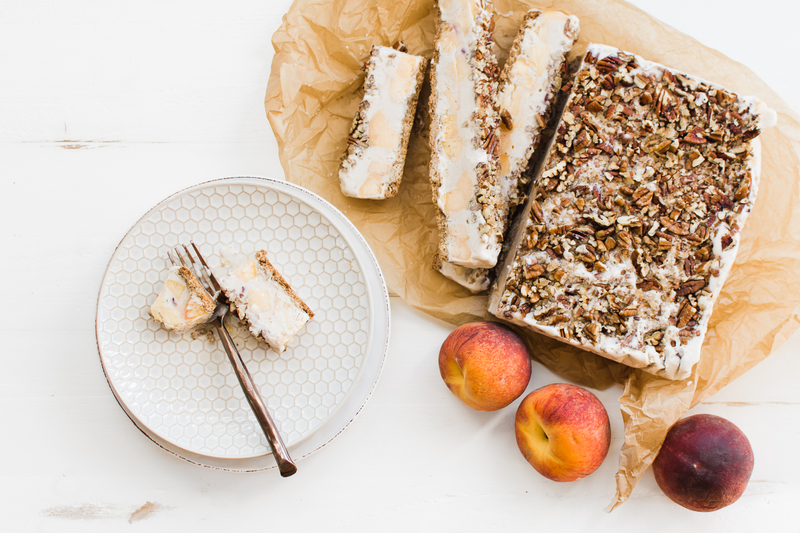 That’s when I whip up these Frozen Gingered Peach Pecan Crumble Bars. Shortbread sweetened ever so slightly by maple syrup forms the base, and creamy layers of peach follow while a sprinkling of chopped pecans a candied ginger tops them off for just the right balance of crunch and creaminess, sweetness and spice. Heat the oven to 350 F, and line a 8-by-8 cake pan with parchment paper, allowing the parchment paper to hang over the sides of the pan by about 6 inches. Toss all ingredients for the crust into a food processor, and process about 1 minute until they form a sticky and consistently uniform dough. Turn the dough out into the prepared pan, and press it down to form a thin, even layer. Transfer the pan to the oven and bake 12 to 15 minutes, or until a caramel brown color barely tinges the edges of the crust, and the crust is evenly cooked through. Remove from the oven and allow it to cool completely. 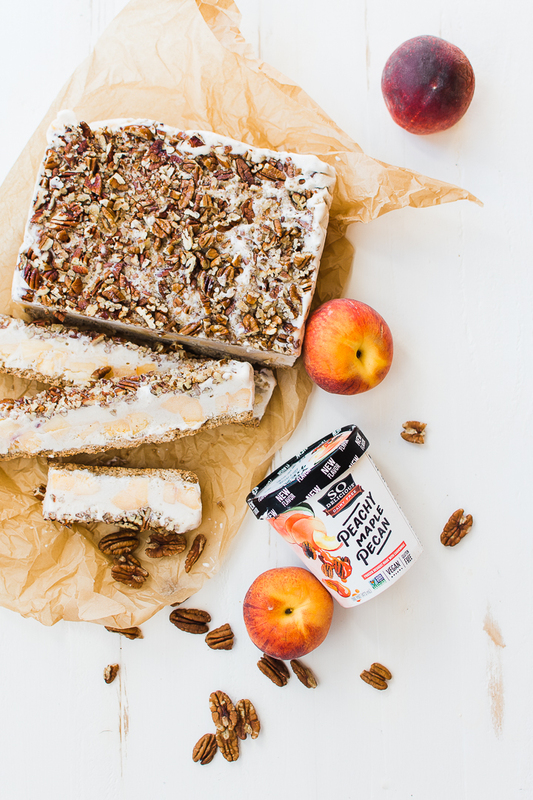 Spoon one pint of So Delicious Peachy Maple Pecan Dairy-Free Frozen Dessert over the crust, and spread it into a smooth, even layer with a spatula. Generously spoon the chopped peaches over the first layer of frozen dessert, pressing them in very slightly. 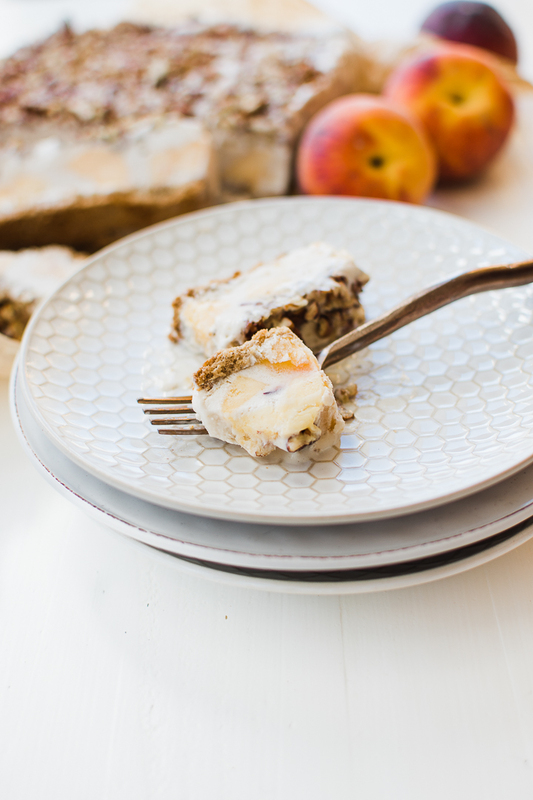 Spoon the second pint of So Delicious Peachy Maple Pecan Dairy-Free Frozen Dessert over the peaches, and spread it smoothly, but gently into the pan. Evenly scatter the chopped pecans and crystallized ginger over the final layer of frozen dessert. Fold the overhung parchment paper over the final layer of pecans and ginger, gently pressing them into the tin. Freeze overnight. Holding the parchment paper, lift the bars out of the cake tin and set them on a cutting board. Warm a knife under hot water, and then slice the dessert at 1-inch intervals to form long bars. Slice these bars in half to form 16 small bars, approximately 1-inch thick and 4 inches wide. When you entertain, there’s good reason to make sure you serve food that everyone can enjoy, and with rapidly increasing rates of food allergies and sensitivities, that’s no small task. Every time we entertain, I calculate half a dozen allergies into my menus: gluten sensitivity (friends), dairy sensitivity (my husband), egg white allergy (me!) which makes this dessert earn a particularly welcome place at the table. So Delicious has a great line of super creamy, dairy-free frozen treats that are based on coconut and cashew. Check them out here. Peach Butter is a great way to use up boxes of late summer peaches from the farmers market, and there’s no sweetener added. Melted Apricots with Fresh Raspberries are a marvelously easy dessert, and excellent served with the lightest dusting of finely chopped pistachios. Strawberry Mint Sorbet is vibrantly fresh, blending the sweetness of early summer strawberries with the bright green notes of fresh mint.